After we visited the petroglyphs on Tuesday, Bruce drove toward Portola, a place in the Sierras I’d never visited. We drove along Heriot Road where cattle grazed behind barbed wire fences. 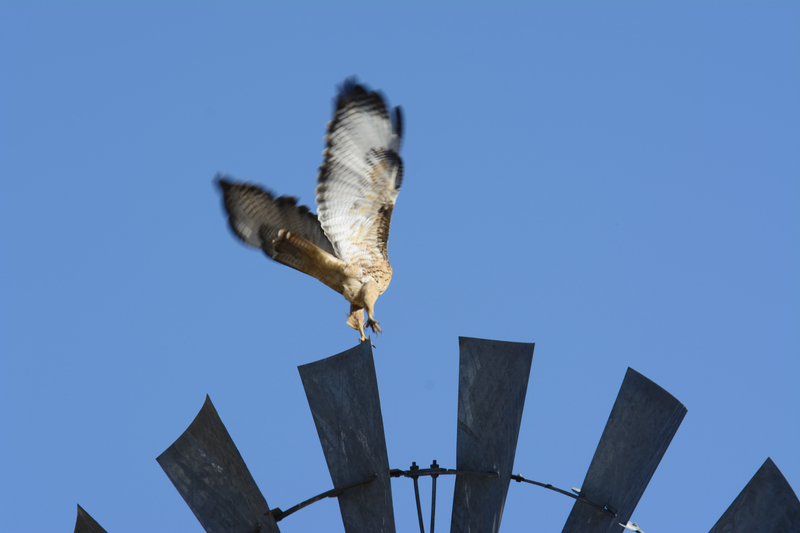 When I spotted a hawk perched atop a windmill, Bruce turned the truck around and returned to the site. There was no room on the side of the road to set up a tripod so I wedged Big Bertha between the truck door and frame, resting the end of the lens on the hood of the truck. It was very unwieldy and awkward and by the time I got settled, the hawk took off but I did manage to get two shots as it flew off the windmill. I’m including one because it’s my first hand-held shot with Big Bertha, although I did have a little help from the truck. 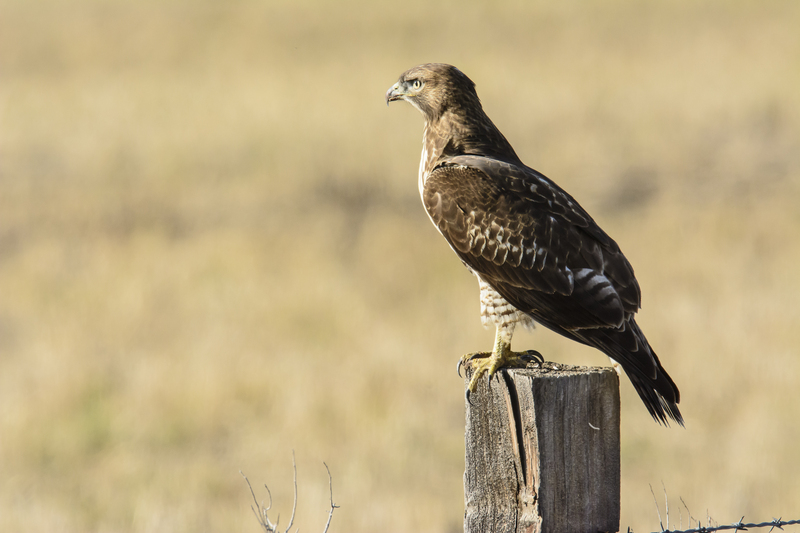 A few minutes later, we found another red tailed hawk that was more cooperative and it perched on a “now-considered-part-of-Nature” fence post. 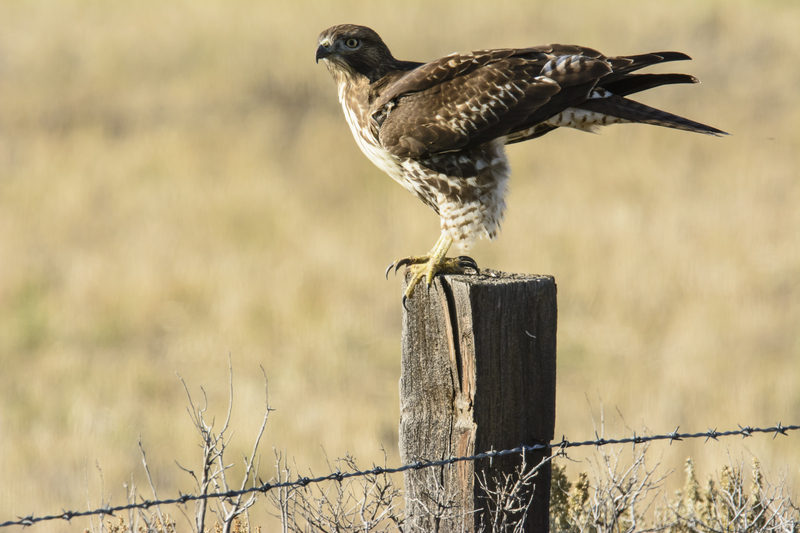 The previous adjective string alludes to the Photographic Society of America (PSA), which has always prohibited “the hand of man” in ‘Nature’ photos, now allowing such things as fence posts when photographing hawks for a “Nature” competition. 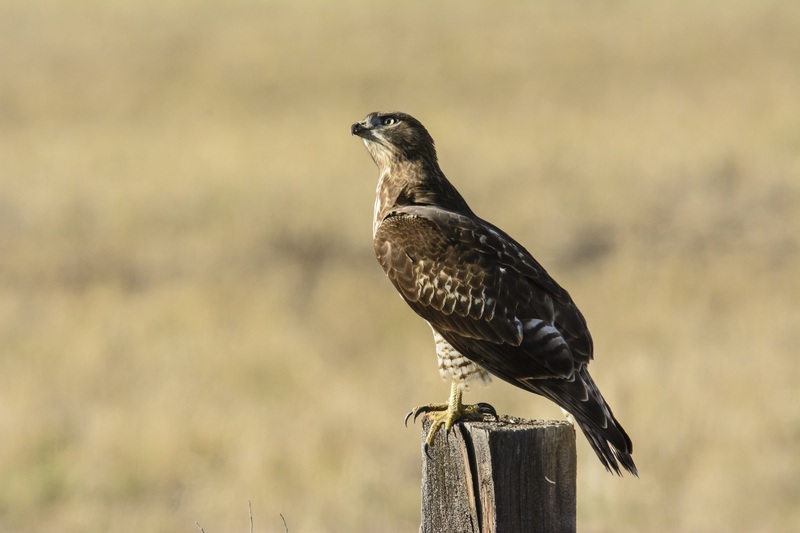 When the hawk decided to fly off, I was unable to follow its flight because I was wedged in the space between the door and the truck body and I wasn’t using the tripod and my fancy gimbal head which would have allowed me to do that. Maybe another day. But I’m very happy with these shots. They are not cropped. In the last shot, the red tail is preparing to take off. This entry was posted on October 10, 2015 by Carol Smith. It was filed under Uncategorized . Nice clean & crisp images, Bertha has served you well. Wonderful! Love the third one especially- head cocked!